Welcome to the October stamp of the month blog hop! If you've arrived here from Helen Onulak's Hooked on Stamping blog, or if you're just starting out here, you're in the right place. After you're done checking out my project, we'll head over to my awesome downline Pamela Ellison's blog, Pam's Clearly Crafty Corner. I'm sure she has something neat up her sleeve for this month. I personally love this Stamp of the Month, Scandinavian Wishes. A big chunk of my family heritage is Swedish, so the designs feel familiar to me. Also, they are pretty versatile, and I am thinking of several ways to use them. For today's hop, I found I couldn't stop at just one card, so I made three different cards! They all started with the same Mojo Monday sketch, and even though the design is the same I think they all feel pretty different. First I made a lovely card that is nice if, like me, you have friends of various religions on your holiday card list. I used Pacifica pigment ink for most of my stamping, and embossed it with Clear Detail embossing powder. I love the rich color achieved with pigment inks, and the nice shine and quick drying when using embossing powder. I created a bit of a background for my "Peace" stamp by stamping it multiple times in 2nd generation Pacifica (regular dye-based ink). I also edged all of my papers in coordinating dye ink with sponge daubers and colored my Color Ready Seam Binding with it also. The pattern paper is from Babycakes, and cardstock is Pacifica and Honey. Circles & scalloped circles were cut using Art Philosophy and my Cricut. For my next card, I went with the more traditional red & white color scheme, adding a little silver for sparkle. I used red pigment ink for the hearts, and again the Clear Detail embossing powder. I used White Daisy pigment ink for the sentiment, and I didn't realize until after I sprinkled on the embossing powder that my stamp pad needed re-inking, so it's not as clear as it could be. Lesson learned - always test the white first! I used White Daisy and Cranberry cardstock, and Silver glitter tape. Finally, I wanted to do something reminiscent of Swedish folk art, but with an updated twist. So, I stamped the same heart in Black pigment ink this time, embossing again with Clear Detail embossing powder. Then I colored in the image with alcohol markers. Since the Laughing Lola papers have so many exclusive colors, I just used the markers I have that were closest. My sentiment is from a discontinued set in my stash, and is stamped in Black pigment ink and embossed. I added some sparkly Glitter Ribbon from American Crafts from my stash. I also used Black and White Daisy cardstock with the Laughing Lola pattern paper. I hope you like my ideas for this stamp set. I have a lot of other ideas for the other images in the set as well, so I hope I find more time to play this month so I can share them with you! I'd love to see your comments, then let's head over to Pam's Clearly Crafty Corner and see what idea she has for us. If you're ready to shop first, head on over to my website now - this link opens in a new window so you can come back here and continue on with the hop at any time! I really like how you created 3 different cards from one design. Lovely. Love to see the variety of cards using the same sketch. 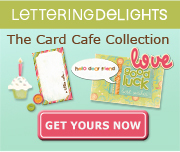 And really like your card with the Laughing Lola paper. You did a great job coloring the hearts and it looks elegant. Love how beautiful all three cards turned out. Great take on the sketch. I love what you have done with this stamp set. Beautiful! These are all just fabulous! Love the little birdie! I particularly love the Laughing Lola card. A truly different take on the stamp. I love how you colored parts of it. I wasn't sure if I wanted this stamp, but now I have to get it. Wasn't that Mojo just the perfect sketch for these? LOVE THEM!! Love your cards. I think the third one is the best!